Business is a flexible field of study that allows students to concentrate on fields from accounting to organizational behavior, finance and taxation. At the doctoral level, business degrees are designed for individuals pursuing careers as scholars, professors, researchers and other advanced business leaders. Learn what business schools are seeking in candidates, discover why admission to online business PhD programs is competitive and understand how earning a doctorate can position you for future career success in a variety of academic, government and business settings. Business is one of the most popular – and most selective – graduate programs today. Growingly, business schools are moving their doctoral tracks online, offering students even more options to consider. With the sheer number of business specializations, from entrepreneurship to organizational management, narrowing down a list of potential schools can be challenging. 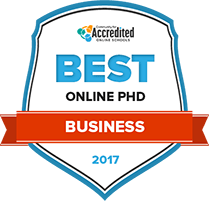 Our 2017 rankings of the best online PhD business degree programs is a great place to start. The University of Charleston was established as Barboursville Seminary in 1888. Its original enrollment of 25 students has grown to more than 2,400 students today. The university’s Doctor of Executive Leadership degree is offered entirely online except for an annual residence at the Charleston campus each year. General curriculum includes studies in leadership, decision-making, ethics, collaboration and the international business environment. Five research courses are required in methods, data analysis and interpretation. Students are also required to complete two proseminars and a dissertation. Applicants must hold a master’s or first professional degree for consideration. Graduates interested in pursuing a doctorate of business administration may complete the entirety of their coursework online with the Baker College Center for Graduate Studies. All of Baker College’s campuses offer the services students require to make their aspirations a reality, whether it's academic advising, tutoring, or career advisement. At Baker College, students are ensured one-on-one time with their instructors, as class sizes are averaged at 25 students, and most instructors have had many years of real-world experience. Courses are able to stay up-to-date with Baker College’s Advisory Board, which is made up of professionals and employers specific to a field of study. Our Lady of the Lake University was founded by the Sisters of the Congregation of Divine Providence in 1895. Today, it enrolls more than 300 doctoral students across a range of programs representing the pinnacle of academic attainment. The interdisciplinary Doctor of Philosophy (PhD) in Leadership Studies program prepares graduates for roles in business, education, and healthcare fields, among others. Requiring completion of 75 semester credit hours, the PhD centers around a 4-5 year-long course sequence and concludes with the student’s delivery and defense of a dissertation. Applicants must hold a master’s degree. Concordia University Chicago offers an excellent opportunity for graduates who wish to further their education with a doctoral program in organizational leadership. Because this program is offered through both online and on-campus courses, students will be able to build a personalized academic plan that will fit into their schedules. The faculty at Concordia University Chicago is aware of the financial burden an academic career may cause, and is proud to offer numerous financial aid opportunities to students that exhibit excellence in their studies. Incoming freshman are able to transition comfortably into their upcoming academic careers with Concordia University Chicago’s Jump Start orientation program. Students interested in completing their doctorate in organizational leadership may wish to apply for the academic program at Indiana Wesleyan University. Split between on-campus and online coursework, this PhD program allows students the flexibility necessary to work their studies into their busy lives. Indiana Wesleyan University disperses thousands of dollars of institutional aid in the form of grants, scholarships, loans, and veterans benefits every year. There are nearly 40 student clubs and organizations at Indiana Wesleyan, including intramural sports and performance arts. Student services include a health center, career center, recreational facilities, and academic advising. In 1893, Johnson University became a residential academic institution and a correspondence bible college. Today it offers degree programs at three campuses and online. JU’s PhD in Leadership Studies interdisciplinary degree program is offered entirely online. Doctoral students can choose from concentrations in Educational Leadership, Organizational Leadership, Philosophy and Theology of Leadership, and Missional Leadership. The leadership core classes are made up of global studies, leadership studies and theory, organizational studies and theory, intercultural behavior, worldview, and communication. Students culminate their doctoral studies with preparation and defense of a dissertation reflecting independent research. At the University of the Cumberlands, prospective doctoral students can pursue their PhD in leadership to advance their business credentials and knowledge. In order to gain organizational leadership proficiency, students will learn various critical thinking and decision making strategies through research, analytics, and communication, and gain specialized knowledge in business leadership. This program is expected to take three years to complete. Financial assistance such as FAFSA, loans, and scholarships are provided for nearly 97 percent of the student population along with various payment plans to make programs financially accessible to students. The PhD in Business Administration degree at the University of Minnesota-Twin Cities is directed by the Carlson School of Management, founded in 1919 as the University of Minnesota School of Business. Students in the PhD can choose from concentrations in Accounting, Finance, Information and Decision Sciences, Marketing, Supply Chain and Operations, Strategic Management and Entrepreneurship, Work and Organizations. During their first two years, students are expected to complete a minimum of 40 semester credits along with 20 hours per week in assigned teaching assistantships. Milestones include a preliminary and oral exam, and a dissertation proposal and final defense. Graduates who wish to earn their doctorate in business administration may be interested in applying for a program with Wilmington University. Students receive their education in a hybrid format, combining both online and in-class learning. With proportional student-to-faculty ratios, Wilmington University gives its students the necessary one-on-one time with their teachers to ensure academic achievement. With state-of-the-art housing and dining facilities, Wilmington University facilitates the personal growth of its students, providing a feeling of communal bonding. Students are also able to regulate their health and wellness with the health and disability service centers at Wilmington University. Located on the Pennsylvania State University-Main Campus, the Smeal College of Business has offered degree programs since 1953. Its PhD Program enrolls only a limited number of students each year. Doctoral students benefit from the college’s research centers and institutes dedicated to the study of supply chain management, commercial real estate, and B2B marketing. PhD students are expected to complete graduate-level courses in research methodology in addition to their choice of concentration among options in accounting, finance, management and organization, marketing, supply chain and information systems, or real estate. Students assist faculty members in projects leading to jointly authored papers. Finding the right school begins with matching personal and academic needs to individual business programs. Use the search tool below to compare different online business programs by tuition, acceptance rate, school type and enrollment, and find the best business school for you. Completing a PhD program in business is a time intensive endeavor that can take upwards of five years to complete. To prepare the next generation of scholars and business leaders in economic research, policy and management, graduate schools have a highly selective and competitive admission process and curriculum. Learn more about what schools seek in candidates, what to expect in a four-year program, and the learning outcomes for those enrolled in business PhD programs. The application process for online business PhD programs requires admission to the university’s graduate school and college of business. Although programs have specific steps, below is a standard list of requirements prospective candidates need to submit to be considered for doctoral admission. Students must submit official transcripts from each university they attended prior to applying for their PhD in business, with information about the name of the school and conferred degree. While the Graduate Management Admission Test is the traditional standardized test used by business schools, the Graduate Record Examination (GRE) is being quickly adopted by graduate programs across many fields of study. For admission into a business PhD program, applicants must submit an official GMAT or GRE score that was taken within the past five years. Prospective business PhD students are required to submit three letters of recommendation from academic and professional sources that speak to the student’s past experience in business and ability to succeed at the graduate level. International applicants (whose primary language is not English) must take and submit scores for an English proficiency examination. The two most commonly accepted tests are TOEFL and IELTS, and are required for international business PhD students. Business schools may also ask students to submit a curriculum vitae (CV). It is a way to provide additional information about the student’s professional experience, educational accomplishments and personal interests. Applicants submit an essay about their academic and professional goals during and after their PhD program, describing how the online PhD in business will help them achieve those goals. It is an opportunity to strategically align career objectives to the specific curriculum and research offered by the target business school. A personal statement is different from the academic statement of purpose. The personal statement describes the business PhD applicant’s life experiences in a personal essay. Generally limited to approximately 500 words, these essays share how their cultural, economic and social background has prepared them to pursue a doctoral degree in business. The first year of an online PhD program in business introduces students to foundational micro- and macroeconomics policy, research methods and academic literature in the field. During this first year, students study methodology in core subject areas and select a specialization for their academic activities. Students complete a roster of required courses, including seminars, in fundamental areas of business including operations management, organizational behavior, financial management, marketing, micro- and macroeconomics and quantitative research methods. Business students typically work as a research assistant during their PhD program, gaining academic research experience alongside a tenured or experienced business professor. Students learn exactly how to conduct business research, and become familiar with industry software, statistical analysis and managing research projects. Working with their advisor, doctoral level business students submit a plan of study that guides the remainder of their coursework and future research. This plan of study includes a business specialization, such as accounting, finance, management information systems, marketing, organizational behavior, entrepreneurship, or international business. The second year of a business PhD program develops the student’s research interests in their chosen specialization. They gain teaching and research experience, build a foundation of theoretical and methodological knowledge in their business field and prepare for comprehensive examinations. During the second year, students complete their roster of required business PhD coursework. This coursework, in subjects such as microeconomic analysis, financial management and marketing theory paves the way to specialized research. Upon completion of their core business PhD coursework, students begin work on their specialized field of study. Students take a variety of elective seminars in the business school, as well as broader topics from other departments, such as behavioral science or sociology. Preparing for a doctoral level business dissertation is a major component of a graduate business program. As students take coursework in their specialization, they begin thinking about their future independent research and what they’d like to study for their dissertation. In conjunction, they work with an advisor to select a dissertation committee that will oversee the research and writing process. At the end of their second year, online business PhD students take a qualifying examination. This examination is an assessment of their progress during the first year of study. The exam covers the topics from their core coursework and research methods introduced in seminar classes. The third year of a business PhD program is dedicated to enhancing research skills to prepare for the dissertation. PhD candidates will write a publishable research paper, work with their committee to outline their dissertation approach and get approval to start independent research. PhD candidates in business work under the guidance of faculty members to prepare a journal-quality research paper. The topic can vary, but may come from a specific course, area of interest or through a collaborative research project with a faculty member. The paper is evaluated by the PhD committee. This examination verifies students are prepared to begin dissertation research in their chosen field. The examination includes two parts, beginning with a written examination that covers core business concepts and topics in the student’s area of study. The second is a preliminary examination administered by the student’s dissertation committee which may be written or oral in format and assess the student’s ability to conduct dissertation research. This is a vital step as students officially become a business PhD candidate. In the third year, business PhD students submit their dissertation proposal to their committee. Students must defend this proposal with the committee by defining the objectives and scope of their proposed dissertation research. Upon completion, students may begin research into their dissertation subject. The fourth year of an online PhD business program is dedicated to dissertation research and writing, teaching courses and preparing for professional opportunities after school. Submission and defense of the dissertation are usually be expected by the end of the fourth year of study. The culmination of four years of business graduate study begins with independent, formal research into a dissertation topic. Whether it is an investigation into demand management, corporate finance and risk management or employee work strategies, business PhD students spend a year or more researching and preparing to write their dissertation. In conjunction with the proposal defense that occurs in year three, business PhD students follow an established plan for writing their dissertations. They meet regularly with their committee chairs to talk about progress and for feedback. Dissertations are traditionally filed a few weeks prior to an oral defense and approximately a month before graduation. The dissertation defense is an oral examination with the committee that allows the business PhD candidate to explain their research, demonstrate why it is important and show the results they have uncovered. Oral defense is generally held four or more weeks prior to the student’s planned commencement date. After an online business PhD students complete a rigorous program of study that includes core coursework, specialized major requirements, research papers and independent research, it’s time to think about the next step: graduation. Learn more about the common requirements to graduate with an online PhD in business below. Earning a PhD in business usually consists of a minimum of 64 to 72 semester hours of graduate work beyond a bachelor’s degree, including an additional 12 to 15 credit hours for a dissertation. Students complete a foundation of courses in their major field (18+ credits) and develop experience in economics, probability and quantitative methods. Students complete original research papers and pass either a written or oral examination to qualify for PhD candidacy. Some online PhD programs in business have a residency requirement. Residencies vary, but some programs require students to complete two on-campus summer residencies, while others may have on-campus training blocks throughout the program. Business PhD students entering with a bachelor’s degree may be required to take a series of master’s level or bridge courses from the school of business (e.g. finance and economics, risk management, marketing). Individuals with an MBA or master’s degree may be exempt from this requirement. The submission of an original, in-depth business PhD dissertation and the subsequent successful defense are the final major requirements for graduation from a business PhD program. Doctoral level business students are fully engrossed with the research process while in school, developing skills to conduct in-depth research studies in their field of interest, such as organizational behavior or advertising. They publish findings in industry journals and contribute to a growing body of knowledge in public and private business organizations. Doctoral students develop advanced capabilities with economic analysis. They take a quantitative approach to create solutions to challenging and complex real-world business problems in business and management. Developing a systems-oriented approach to critical thinking, students advance theoretical approaches to leadership and business operations are important for business PhD students. Doctoral students will develop advanced knowledge of the interconnected aspects of business, including domestic and international marketing theory, consumer behavior and business strategy. With this understanding of the different business functions, including marketing, finance, management and operations. Business PhD students are able to help make decisions and analyze the economic impact of those choices. According to AACSB International, business is a trending field for a few reasons: senior faculty members are aging and retiring; there has been a continued increase in the number of students seeking business degrees; and the number of students completing doctoral business programs has remained relatively flat for the past twenty years. Online PhD programs in business prepare graduates to purse academic, research and advanced level private careers across a diverse range of fields. Learn more about potential occupational avenues after earning a PhD in business below. Business professors are academic researchers or business professionals with experience in specialized fields, such as finance, marketing, economics or business management. They conduct independent research, teach classes and mentor students. Traditionally, business professors also serve as consultants, leveraging their professional experience and research with finance, accounting, management and other business firms. Using statistical techniques and mathematical models, economics develop economic analyses across professional fields, from education to international business, healthcare to government. Depending on their role, economists may generate economic forecasts for a government agency, present findings about employee performance for a Fortune 500 company or predict exchange rates for international manufacturing companies. Investment bankers serve as financial advisors to government organizations and corporations. A diverse occupation, investment bankers may help their clients raise capital, secure underwriting, establish market value for a merger or acquisition, or sell securities. Management analysts are experts in organizational efficiency, with an advanced understanding of how to increase a business' productivity to improve performance and reduce costs. In this role, they may analyze financial information (e.g. revenue and employment data) to identify organizational deficiencies, create new systems or change procedures. Prospective students considering an online PhD in business may want to learn more about the field, find networking opportunities, review different graduate school options or read about potential career paths. The following resources are a great starting point, each offers an array of information around business education and professional development. The American Management Association (AMA) provides professional training and development programs in areas such as leadership, project management, finance and accounting, and analytics. Best Biz Schools is a resource offered by the Association to Advance Collegiate Schools of Business that offers information about graduate programs in business, advice for financing a degree, and program rankings. A national organization with more than 43,000 members across 2,300 local chapters, Business Professional of America help students succeed, develop real-world business skills and prepare them for new employment and career advancement opportunities.